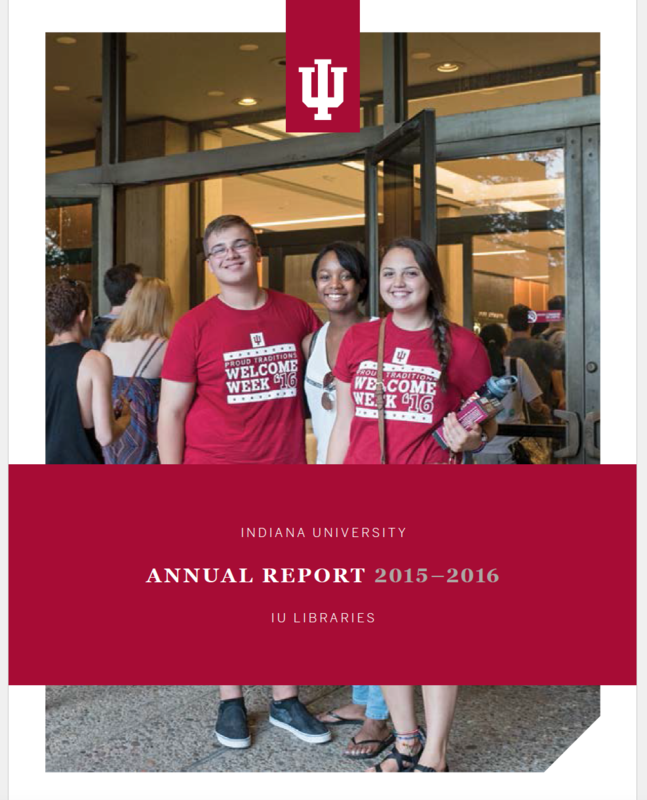 Sharing our successes of the past year, this annual report is framed in the context of Indiana University’s Bicentennial Strategic Plan and IU Libraries’ role in executing it. Explore what it means for our libraries to contribute to the Excellent Education students receive at Indiana University—in particular, our unique Jay Informational Literacy Grant Program and its impact in the classroom. Impact in the publishing world is also part of our story. There is no question that IU Press is thriving since joining IU Libraries. Read more about collaboration in action at the Office of Scholarly Publishing, and its connection to Excellence in Research. We are also stepping forward when it comes to the Centrality of Information, Building for Excellence, and the International Dimension of Excellence - you can learn more in the full report. In the final pages of this report we celebrate the extraordinary acquisitions of the Lilly Library this year. To request a printed copy of the report, please contact Michelle Crowe, IU Libraries Director of Communication.